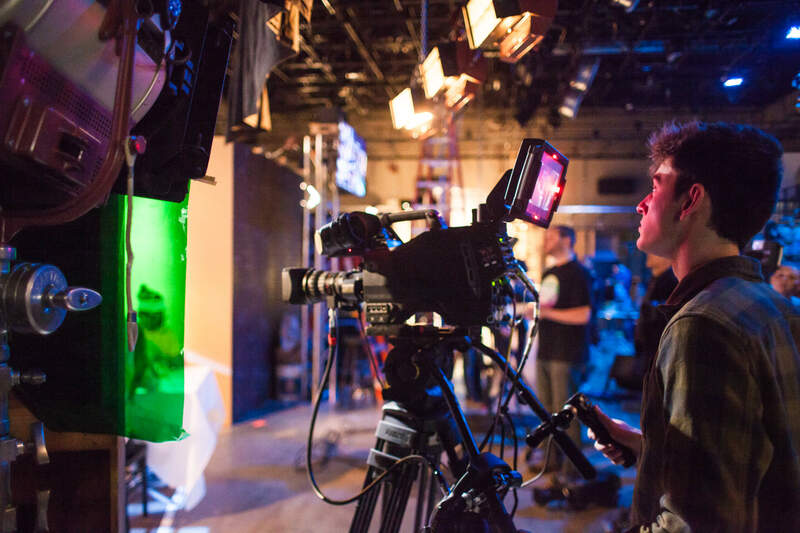 Columbia College Chicago’s landmark television major produces professionals with job-ready portfolios in four key concentrations: Writing/Producing, Directing/Production, Post-Production/Effects, and Internet and Mobile Media. You’ll create television in your first semester, immersed in a curriculum that emphasizes the future of storytelling and surrounded by like-minded and passionate students and faculty members. Television majors focus on one of four concentrations. 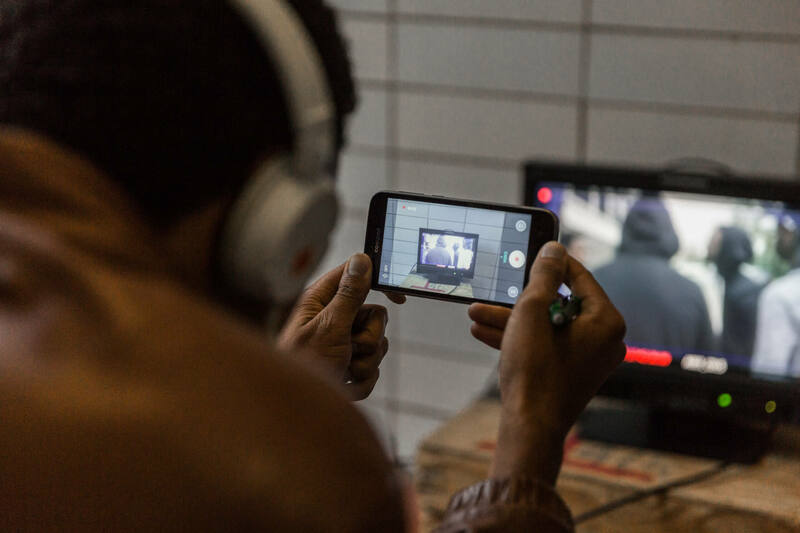 Our Internet and Mobile Media program is ideal for students with self-directed vision and drive—DIY media-makers whose projects don’t fit the mold of traditional television production. We offer a blend of theory and practice in an environment that allows you to broaden the work you already do. You’ll study how to use YouTube and emerging media platforms for branded entertainment, webisodes, and interactive video. You’ll learn how to enhance your social media brand and use analytics to discover new ways to reach your audience. If you’re an entrepreneur, a writer, or a performer, you can customize an academic path with this concentration. In the Post-Production and Effects concentration, you’ll learn to make television look and sound as good as it can. You’ll use principles of art and design along with digital technologies to create special effects and visual style. This program focuses on advanced editing, motion graphics, and visual effects for a variety of genres, formats, and platforms. You’ll build expertise with software and with techniques that are relevant to broadcasting, internet, and mobile media. You’ll also study camera techniques, which are key to understanding and executing motion graphics. Along the way, you’ll learn to collaborate with directors and producers. In this concentration, you’ll build a portfolio and market-ready skills that are incredibly versatile. Editors and motion graphic artists work in post-production houses, television stations and studios, media companies, nonprofits, advertising agencies, and more. Television has never been more relevant. There are more original shows, ways to watch them, and television jobs than ever before. As a Production and Directing student, you’ll learn how to operate cameras, lighting equipment, sound equipment, and editing software. More importantly, you’ll learn how to use them to tell compelling stories. This concentration emphasizes both the artistic and technical aspects of single- and multicamera shoots. You’ll learn to direct live TV broadcasts, calling the shots in a studio or in our state-of-the-art remote truck. You’ll also gain experience directing scripted shows and working with producers and actors to create serial dramas, sitcoms, and programs in other genres. In today’s media landscape, some of the most sophisticated storytelling happens on television. It’s a medium that allows us to create complex worlds and idiosyncratic characters in long-form narratives. As a Writing and Producing student, you’ll develop your own creative voice and the practical knowledge to bring it to the screen. You’ll begin by taking core courses that provide a strong foundation in all aspects of television production. You’ll learn the history and aesthetics of television and the cultural and ethical responsibilities you’ll have as a media-maker. You’ll pitch, write, direct, shoot, and edit live and scripted shows, using both single- and multicamera formats. As you progress in your major, you’ll likely gravitate toward either writing or producing, but it is essential to understand both. 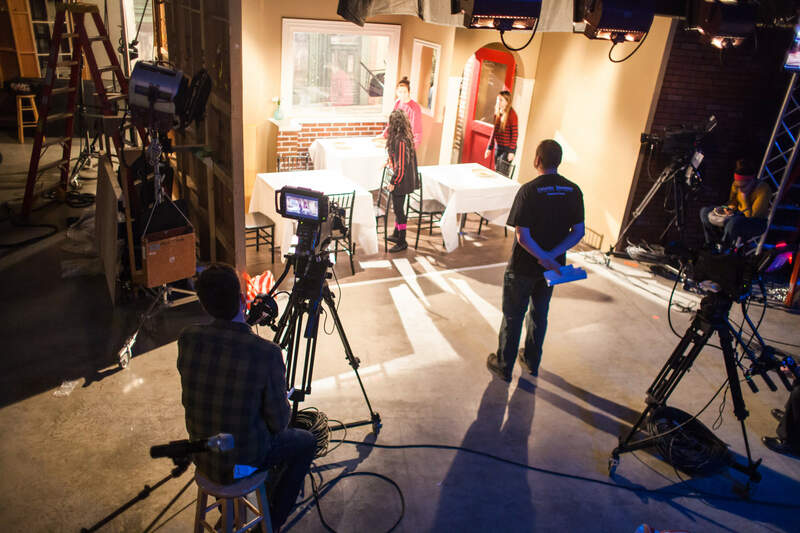 As a first-year student, you’ll complete a series of core Learning Community courses that’ll introduce you to each phase and role in a TV production, including writing, producing, directing, lighting, editing, camera operating, and graphics/effects. Through these courses, you’ll explore the aesthetics and techniques of television and learn how to use them. Our students progress through these classes with a small cohort, learning how to collaborate and build a strong network from the start. You’ll develop, pitch, and translate ideas into a visual medium. In the fall, you’ll work in a multicamera studio setting, focusing on live TV production. In the spring, you’ll expand that knowledge by writing and producing a scripted show. 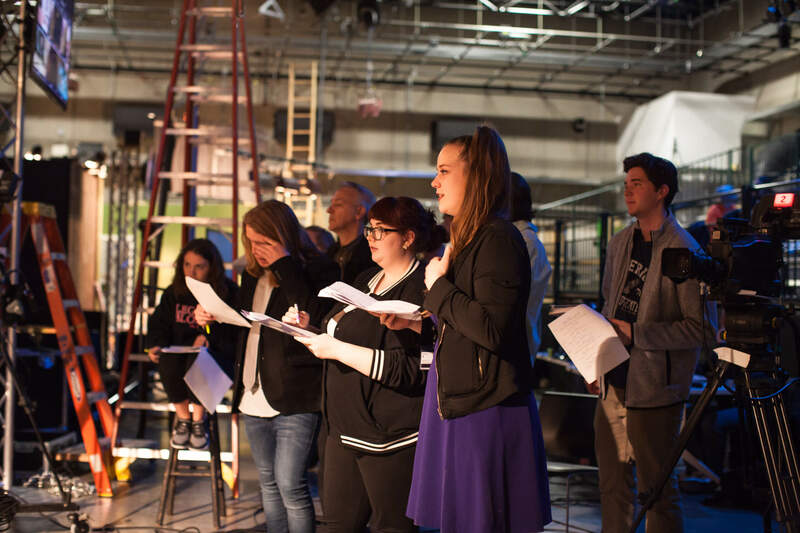 First-year students often volunteer as assistants for department-produced shows on Columbia’s own television station, Frequency TV. What you do in your final year depends on your concentration. Internet and Mobile Media students will take advanced courses in writing for web video and refine production techniques specific to internet and mobile TV. Post-Production and Effects students spend much of their last year editing student-produced capstone television shows as part of an advanced post-production course. Students focusing on motion graphics take a practicum course and create entire campaigns for on-campus clients or local nonprofits. 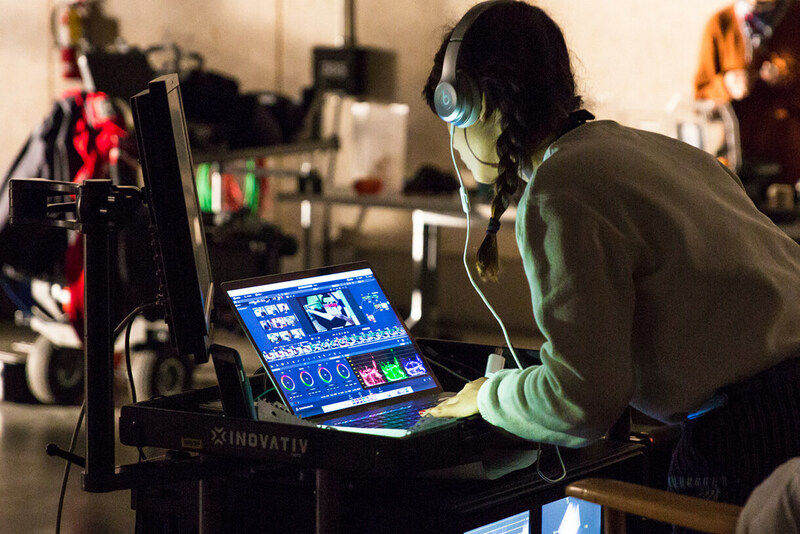 Advanced Post-Production and Effects students are particularly poised to take advantage of internships and entry-level jobs in the field. 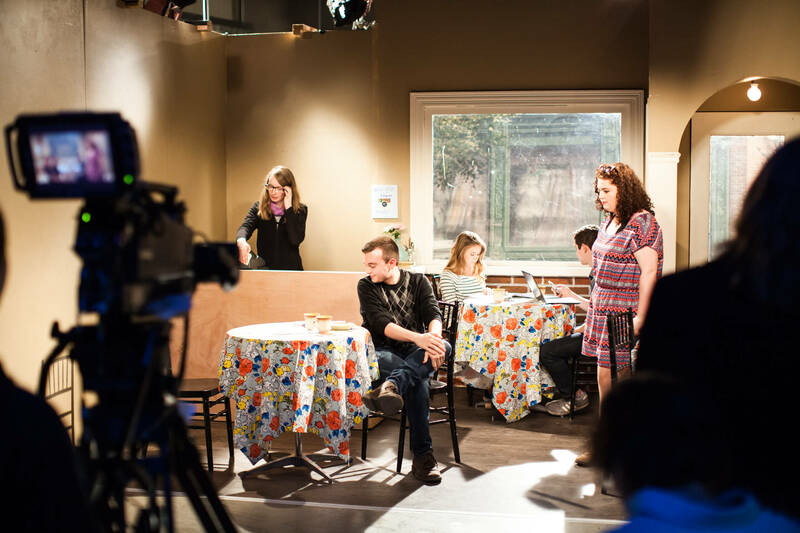 As a Production and Directing or Writing and Producing student, you’ll get behind the camera by directing capstone shows, both live and scripted. You’ll likely gravitate toward specializing in a particular form of technology (such as cameras and lighting) or working with actors. Television is a collaborative medium, so you’ll work with your peers in the department and across the college, creating with directors, editors, costume designers, musicians, and actors. All of our Television students are encouraged to apply for Semester in LA, an immersive 15-week program that allows juniors and seniors to intern in the field and attend classes on a historic Hollywood lot. Want to see what Hollywood is all about? As a Television student, you can take part in Semester in LA, an intensive 15-week course that puts you in touch with industry professionals and gives you unparalleled experience in the area of your choice. Visit the SiLA website for information about this on-site study experience and the kinds of classes offered each semester. Frequency TV: Columbia’s student-run television station, featuring news, talks, comedy series, and more. DocYourWorld: An annual two-day event showcasing nonfiction content produced by students, faculty members, and alumni from several departments at Columbia. Student organizations: TV students are active in a number of campus groups, such as the Television Arts Collective and the Columbia College Chicago Comedy Club. There are many opportunities for internships in Chicago, Los Angeles, and other cities. Our students have interned at TV stations and studios (like ABC 7 WLS Chicago and Telemundo), production companies, post-production houses, documentary production houses, and casting agencies. They have also interned with shows like Chicago Fire. Internships are typically entry-level jobs as production and executive assistants—the time-honored route toward expanding your network and building a resume with real-world experience. Approximately half of Television students complete an internship. Learn more about how Columbia’s Career Center can help you find the right internship. Columbia College Chicago alums are behind some of the most innovative work in film and television, and some have even won Oscars, Emmys, and Golden Globes. Phillip J. Bartell '92 is a filmmaker, writer, and editor for TV and film. Bartell edited the 2014 Sundance Special Jury Prize-winning film Dear White People and the Netflix show of the same name. Ayanna Floyd MFA ’98 was coexecutive producer for the TV shows Empire and Falling Skies, and has writing credits on episodes of Empire, The Chi, Falling Skies, and Private Practice. Michael Goi '80 is a cinematographer, director, writer, and producer who has worked on films and TV shows such as The Mentalist, Glee, Pretty Little Liars, and American Horror Story. Goi is a past president of the American Society of Cinematographers. Tiffany S. Griffith '92 is an Emmy Award-winning dialogue editor for shows like Stranger Things, American Gods, Insecure, and House M.D. Janusz Kaminski ’87 is a two-time Academy Award-winning cinematographer, whose credits include Saving Private Ryan, Schindler’s List, Lincoln, and The Post. Declan Quinn ’79 has credits as a cinematographer and director of photography for Leaving Las Vegas, 28 Days, and My Next Guest Needs No Introduction with David Letterman. Christian Sprenger ’07 is the Emmy Award-winning cinematographer for the TV shows Atlanta, GLOW, Baskets, and Last Man on Earth. Antonia Tighe MFA'02 is and editor and Emmy-winner on the TV series Top Chef. Lena Waithe ’06 is an Emmy Award-winning writer, actress, and producer on shows and films such as Dear White People, Bones, Master of None, and The Chi, and was named one of TIME magazine’s 100 most influential people of 2018. Annick Wokan ’05 is an associate producer for the award-winning TV show Game of Thrones. Audio suite: instruction and post-production space with professional-level systems for sound design and mixing. Equipment Centers: all kinds of camera, lighting, and audio equipment are available for checkout in five locations across campus. Media Production Center: 35,500 square-foot facility with two film sound stages, digital labs, animating suites, and classrooms as well as a fabrication shop and motion-capture studio. Post-Production Center: state-of-the-art systems for editing, coloring, and finishing as well as creating effects and mastering objects. TV studios: three multi-camera, high-definition studios. Visit our facilities page for more detailed information. Television faculty members are award-winning showrunners, directors, producers, writers, scholars, and documentarians with various specialties and perspectives. They’re also dedicated teachers whose innovative methods, technical expertise, and industry connections will help you launch your career as a media-maker.